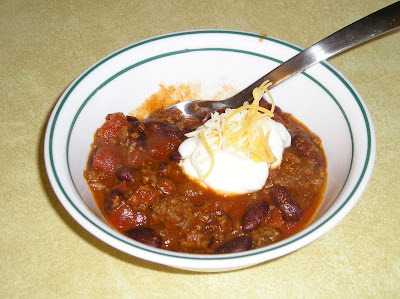 I used to make chili in the crockpot, but mine bit the dust over a year ago and I haven't replaced it. So I had to come up with one that was just as easy and was made on the stovetop. I found one on allrecipes.com and changed it up to fit my tastes. In a large saucepan, saute the onion and garlic in olive oil until soft, but not browned. Brown the ground beef either in a separate skillet or in the microwave. Drain. Add to onion and garlic. Add the tomatoes (with their juice), tomato sauce, and kidney beans. Season with chili powder, red pepper flakes, salt, and pepper. Bring to a boil. Reduce heat to low, cover, and let simmer for at least 15 minutes. The longer you let it simmer, the better the flavors meld together. If you simmer for an extended amount of time, you might need to add some water with the other ingredients so it doesn’t dry out as it reduces. It is really good served with some shredded cheddar cheese and light sour cream. This recipe is nice because it can be ready in about half an hour (if you let it simmer only 15 minutes.) And it tastes just fine this way. But the longer you let it simmer, the better it gets. The reason I saute the onion and garlic before adding the hamburger is because I like to make sure they are soft. I like the flavors they add to the finished product, but I don't want to have big chunks of them when done. And this way Jim doesn't even notice them! You may still see some small pieces of garlic, because it is white and not clear. But as long as it is soft, you won't even taste it. The other reason I don't brown the hamburger in the pot is that it hard to drain and I usually buy the cheaper stuff that has to be drained before anything else is added. And the spice is really easy to alter to fit your tastes. The recipe I found online only called for a pinch of chili powder. You couldn't taste it at all! So I upped that quite a lot and added a bit of extra heat with the red pepper flakes or cayenne. So easy and good... thank you! Thanks for letting me know you liked it, Megan! Glad you enjoyed it.